A degausser uses a powerful magnetic field to completely and permanently erase all data from hard drives, tapes and other magnetic media. Degaussing with one of our devices wipes 100% of the data, guaranteed. It’s absolutely the best way to erase end-of-life media, and it only takes a matter of seconds. The GDPR requires you take “reasonable” steps to protect sensitive data, but why settle for “reasonable”? Wipe out the data and the risk with a degausser. Discover how degaussing works and why it's the best way to dispose of data on magnetic media. Which degausser do I need? Degauss, destroy and recycle with a bundled hardware package built for mobility and value. We are proud to be Garner Products‘ international distributor for the EMEA region. 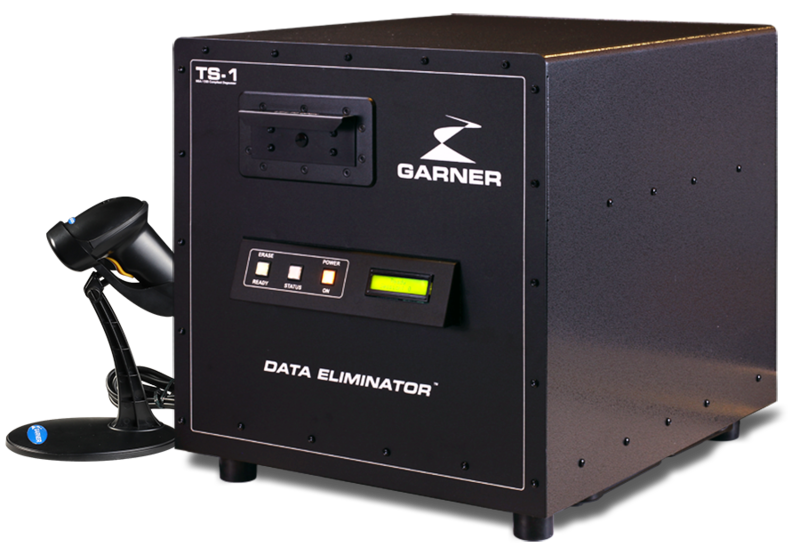 Garner Products, Inc. is the leading manufacturer of data degaussers and physical hard drive destroyers which guarantee total data elimination. Garner degaussers permanently erase data from hard drives, LTO and DLT tapes, and many other magnetic media formats. Pair with a Garner physical destroyer to efficiently bend, break and mangle hard drives to prevent re-use. Built with best-in-class heavy-duty design, Garner equipment is suited to any environment, from the office to the battlefield. Garner degaussers are also compatible with optional IRONCLAD verification technology, which provides audit-worthy proof of destruction for total compliance with data handling regulations. Garner’s NEW HD-2XTE automatic degausser magnetically destroys all data on hard drives and tape in ~7 seconds, verifies the erasure field strength, and numerically displays the gauss level after each cycle. It erases hard drives (laptop, desktop and network up to 1.5″ high) and high coercivity tape media, including all LTO, all DLT, AIT, 8mm and more, all without any adapters. Features include a continuous duty rating (no cooling necessary) quiet operation and a 60 second cycle time. Now even lighter, only 15.5kg. The HD-3WXLE is the most popular and innovative product in Garner’s line of hard drive and tape degaussers. The user friendly input system provides effortless loading of various sized hard drives and tape media without the need for adapters. Once degaussed, the media is automatically released down the exit chute. The HD-3WXLE erases all hard drive and tape formats that fit into the 6.75 x 4.5 x 1.8 inch degaussing chamber. Media formats include large & small hard drives, network hard drives, LTO, SuperDLT, DLT, 9940, AIT and more. Our most powerful degausser for top secret data erasure – NSA/NCSC listed! 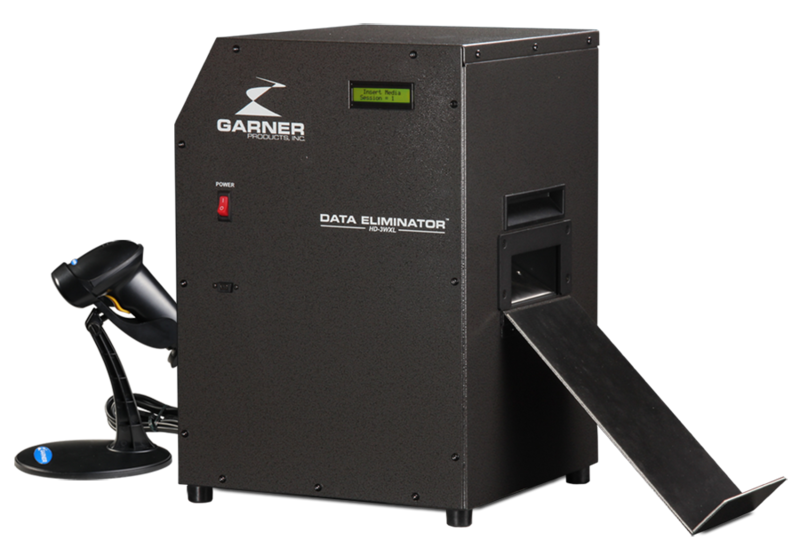 The TS-1E Data EliminatorTM, an NSA Evaluated Products List High Security Degausser, utilizes Garner’s proven solid-state technology to provide a 20,000 gauss erasing field ensuring complete hard drive and tape erasure of classified and “Top Secret” data in 45 seconds. The IRONCLAD system provides audit worthy proof of destruction in a completely automated way. Be both secure and compliant with the Garner IRONCLAD. 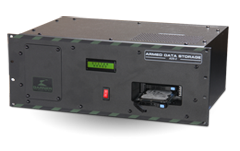 Armed Data Storage provides instant data erasure of data contained on hard drives. Only a push of a button or signal from a remote location is required to activate the erasure. The hard drive doesn’t have to be powered down or removed from the computer as the hard drive is operating from within the degaussing chamber of the ADS-2E.